As Brainiac flees with a number of the villains, the Justice League continues to fight those remaining. Parasite steals the Kryptonite from Metallo and goes to kill Superman with it. When he attacks though, he is surprised to find Captain Marvel masquerading as Superman instead. Then Green Lantern reveals he's been carrying blue Kryptonite with him and tosses it to Iron to take Bizarro down. Captain Marvel destroys the Kryptonite and then takes Black Adam down as well. John Stewart uses his newly acquired ring to cover the area. He wipes Brainiac's nanotechs from the air, erases the knowledge of the League's identities, and removes Brainiac's control in one move. Hal Jordan attacks Sinestro and the two battle. 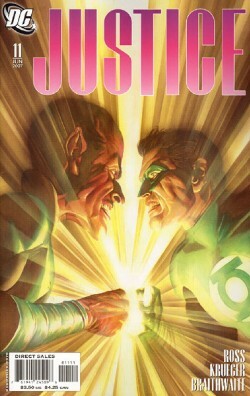 As they both lose power, Hal continues with a fist fight. The other heroes stand victorious, but then quickly learn that Brainiac has control of nuclear weapons around the world. Brainiac arrives at his destination with Aquaman's son, and Aquaman chases after him. As the other heroes arrive, they find thousands of Brainiacs to distract them. Hal continues to win against Sinestro, finally taking him down. The heroes tear through the Brainiacs looking for Aquaman's son, but cannot find him. Superman speeds off to save the other people there. As the heroes assemble, Scarecrow comes to face them. He spreads his fear gas among the people there and watches as they begin to kill each other. Story - 3: This was by far the strangest issue of Justice yet. On one hand, I loved the fight at the beginning (even if some moments were confusing) and I also loved the fight between Hal Jordan and Sinestro (regardless of ulterior motives to that fight). On the other, however, the chase at the end to find Brainiac just seemed strange. Maybe it was just me, but moments like coming over the hill to find a sea of Brainiacs were just weird. First, the good. I did like that the fight was filled with revelations to trick the villains. Hal wielding a yellow power ring disguised with blue Kryptonite was cool. However, it took me a couple reads to actually figure out that's what they were doing. The Captain Marvel switch for Superman was also a very nice moment. My favorite was Hal Jordan taking down Sinestro. Now I've said before that this book is too much of an attack against the modern DCU, and to me this whole fight felt like Ross' personal "anti-Emerald Twilight", but I'm willing to ignore that for a good story. It is really nice to see Hal being tough. The bad really through the issue off for me. I've mentioned a few things, but what I really didn't like was the Scarecrow ending. We just came out of a huge brawl between dozens of metahumans, and the last big cliffhanger of the series is Scarecrow? That just doesn't make sense to me. Maybe it will in two months when the final issue rolls around, but it just seemed strange here. I actually paged through the end of the book a few times because I couldn't believe that was the ending. Overall, this issue had some great moments, but the whole story just felt rushed, and the ending was a big let down. Hopefully they can pick it up for the last issue, because this has been a great series and I would hate for it to go out on a low note. Art - 4: More gorgeous Ross art that I really can't say any more about. The panel layout continues to annoy me, as I feel it distracts from the story, but everything still looks great. I will be sad when Justice ends and the only Ross work I get each month is a (boring) Justice Society cover. Cover Art - 5: And speaking of covers, I love this one. Something about paints just lends them very well to Green Lantern's powers. I like the simplicity of this cover too, just the two of them facing off against each other. It's a simple concept, but it fits the story and looks great. Probably my second favorite cover of the series, second only to the fantastic Superman cover from issue four.